Most readers interested in tarot own a couple of different decks as well as some tarot "cookbooks" that explain the meaning of the cards and their symbolism--like Cliff Notes for tarot. These tarot tools result in fairly standard, mundane readings. But there is another level to tarot--a level that can turn an ordinary tarot reader into a true adept. 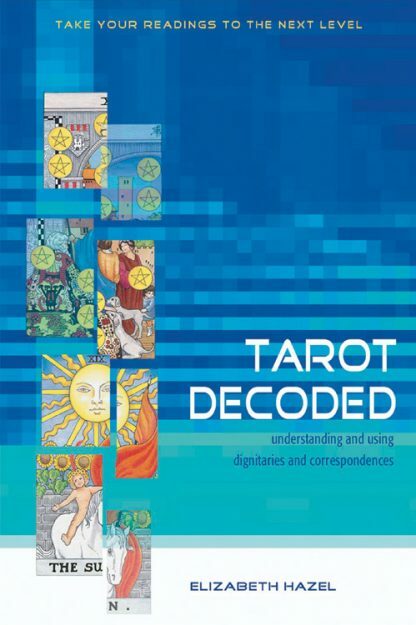 Tarot Decoded transforms ordinary tarot readings into readings that are profound and even surprising by explaining the use and significance of tarot dignitaries. Tarot dignitaries are the interaction of the cards with each other in a spread and within a range of correspondences. Tarot author Elizabeth Hazel presents a concise, useable system for working with tarot dignities to add incredible depth to readings. One card placed next to another might not have a readily apparent connection--but interpreting tarot dignities could make it very clear that one card enhances, or hinders, the meaning of another. The same is true for tarot neighborhoods within a spread as well as the entire reading. Using the Tarot Decoded system for working with tarot dignities can take anyone to the next level of tarot reading. The book offers a progressive look at the cards, their dignities, and their correspondences. With Hazel's advice and clear examples--and a little practice--readings take on a new depth, integration, and power.